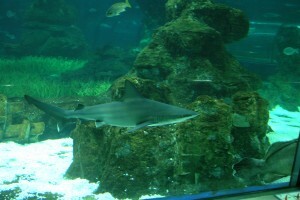 The sandbar shark has a hydrodynamic body, grey on the back and white on the belly. The first dorsal fin is notably larger than the second, and it has between 14 and 15 rows of broad, dentate teeth suitable for cutting prey. Its maximum size is 2.5 m.
It makes large annual migrations in organised groups of different sizes and sexes. They can eat at day and night, although they are more active at night. They are not aggressive and no attack has been reported. This is a carnivorous animal that feeds on fish, sharks, octopus and crustaceans. Its reproduction is viviparous. They give birth to up to 14 foetuses and the period of gestation is from 9 to 12 months. Births are every 2 years. This is a pelagic shark that can live both close to the coast and far from it. Although they like life close to the bed, they come very close to the coast and even enter ports and bays, but they avoid estuaries. This is a cosmopolitan species that is found in tropical and temperate waters, preferably above 23ºC (Mediterranean, Red Sea, Caribbean and the coasts of Africa, South America, Australia and Indonesia). A species of less concern, but which is close to being evaluated as vulnerable (according to the red list of threatened species). Despite its size and the characteristics of its teeth, this shark species is not related to attacks on people, which is thought to be the result of its preference for eating live fish and invertebrates (different from humans and therefore avoiding all possible error). WARNING: an aquarium is a very delicate, constantly envolving environment. This means that during your visit you may find that one or more of the species listed in the tank happens to be missing for reasons completely beyond our control; despite our desire to ensure that visitors have the opportunity to see and learn about them all.